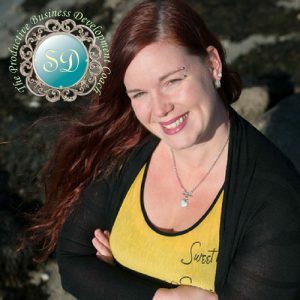 Suzanne is The Productive Business Development Coach. She will take a deep dive into your business focusing on Business Structure, Marketing & Sales. She then helps you create a strategy for each of those facets and helps coach you through implementation. While also incorporating mindset coaching to help her clients keep that healthy balance in their lives during their business transition. Suzanne has worked in the field of marketing for 17 years. She developed and launched her own marketing firm in April 2007. Her primary focus what’s to work with small businesses that needed affordable marketing options. Suzanne has now worked with hundreds of companies creating branding, high exposure, lead generation and overall sale increases for her customers. Most customers have seen their revenues triple. Suzanne does not work with everyone; you have to apply to be considered. She does discovery calls with each individual who applies to see who would be a good fit for the program. Spaces are limited and her time is very important. When you are applying please be sure that you are ready to take the next step and are committed to increase your wealth, income and personal well-being! Does working with Suzanne peak your interest? Spaces are limited and she does not work with everyone. You must apply to be considered. Book your Discovery Call Now. 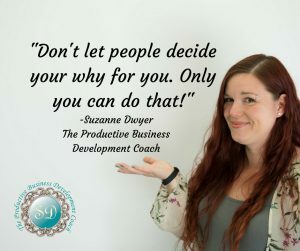 Suzanne is The Productive Business Development Coach. Goals and milestones will be set and followed throughout this process so you may see the progress as we go. This structure keeps you and your business on the track you have set — continuously moving forward toward your goals and objectives. The results are that you experience clarity of what success means to you, and the means to create success. Suzanne incorporates a lot of Life & Mindset coaching aspects into her coaching style. This makes sure that the full spectrum of your life is running smoothly and has plans in place for the areas that don’t. 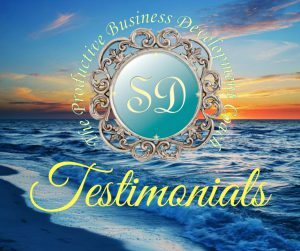 She feels that it is necessary to have all aspects of your life working together properly to be able to have a successful business. She has created online and live training and coaching series to be able to best help her clients no matter where they are in business, life or the world. Below are some of the services that she offers. She is currently working on the development of more! Healthy Balance- This is designed for the overwhelmed business man or woman. It primarily focuses on business professionals that are having a hard time balancing between their work and personal life. This is not only for business owners but also for people with high positions of power that come with a lot of stress. Social Media Marketing Boot Camp- This is a Boot Camp for Serious Entrepreneurs to get the basics for building a solid Social Media Marketing strategy and launch it quickly. You will learn a number of key elements designed around online marketing and advertising to your key demographic. Entrepreneurial Paradise- This was designed with entrepreneurs in mind! Suzanne works with you to setup a solid platform for your business that will help you start off as strong as you can as a new business. Step by step approach on how to start and run your business on a daily basis with the highest growth potential. Total Business Makeover- This is a deep dive into the marketing, business structure and sales of your company. We go over all of your challenges and devise plans to overcome all of them, while building a new structure together that will run like clock work with very little effort. This is a course that does include individual coaching sessions 2x per month and one group coaching session per month. Ongoing Coaching- This program is designed for business owners who need a good deal of assistance with their business. Here we will focus on Marketing Challenges, Business Challenges, Sales Challenges & Personal Challenges. Having these components in alignment your company will soar! This program is designed all around you and your needs. Do you feel like working with Suzanne is the right fit for you and your company? Book your Strategy Session Now! Jim Walters, President at My World Foods Inc.
Like what you are reading? Book your Strategy Session now to see if you qualify!